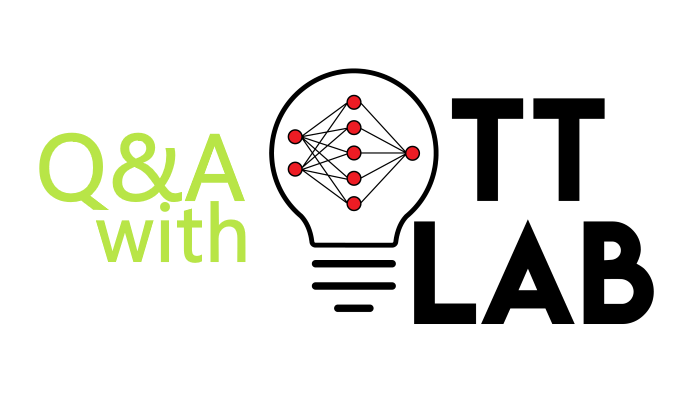 What is TTLAB and why the name TTLAB? TTLAB is an adhoc group of young researchers who, irrespective of their academic level, are interested in performing research and publishing. It all started with an experiment to see if an undergraduate student (in this case a returning NASA Fellow) with proper supervision, could do sufficiently high quality research for international publication without having taken graduate courses. This was quite successful with the student completing four publications in his first year. Based on this success TTLAB was formed and it now consists of UWI postgraduate students, returning (and local) Scholarship winners (Associate Professionals) and also foreign researchers. Members perform research in their areas of interest under my [Dr. Patrick Hosein] supervision. These areas include Machine Learning, Operations Research, and Wireless Communications with members having first degrees in Computer Science, Electrical Engineering, Statistics and even Mechanical Engineering. The size is now limited to 20 members in order to maintain close research supervision. TTLAB’s focus is on research and since each member is personally supervised by me I have placed a maximum limit on size. However, TTLAB is used by many to do research and publish before going off to do a postgraduate degree either here or abroad since publications are extremely helpful for Graduate School admission (more important than grades). Hence time spent within TTLAB is relatively short and so we are always looking for bright dedicated researchers to replace those who leave. As for involving other individuals, we are in the process of developing a collaboration platform (discussed in more detail below) that would be open to all. Has this been done elsewhere (other countries)? Unlike developed countries or even big developing countries, we have limited researchers in specific areas especially in high technology fields. In addition, research collaborations (within/across Tertiary Institutions and between Academia and Industry) are very limited. Because of these issues, a structure such as TTLAB is needed locally. Therefore I am not sure if such a structure exists in other countries but in many cases it is not needed. TTLAB has members in multiple disciplines, multiple Universities and we collaborate closely with multiple companies and local Institutions. We have MOUs with four companies as well as with CARIRI (and will soon have one with NIHERST). Local companies do not have the funds (nor the need) for full time research staff and in some cases TTLAB has been serving that function. What are some practical results that have come from TTLAB so far? Since our focus is on research, we typically stop at the prototype stage. Our first collaboration was with T&TEC and we developed a prototype fault detection application. We are in the process of developing prototypes for other companies but these are covered by non-disclosure agreements. In addition, we have developed prototypes for automating processes within the UWI (one for the Library and one for the Examinations Section). Finally, we are presently working on a collaboration platform on which researchers and developers can register and provide their expertise and background. In addition, individuals or companies can register projects along with the specific human resource needs. A validation process is being developed to ensure that the provided information is correct and we then compute a suitability metric to match researchers/developers with projects/startups (sort of like a Tinder for researchers). How can TTLAB help with these key issues; Poverty, diversification, environment and leadership? We presently collaborate primarily with companies. I believe collaborations with the GORTT will allow us to help tackle the key issues you identified. Unfortunately, except for a brief prospect of a project with the Ministry of National Security, we have not been able to form relationships with the GORTT. One should note that TTLAB members are encouraged to take leadership roles (e.g. team leader for a group working with a company) and to volunteer wherever possible and many do. There is a github account linked to from your website. What will that be used for? This is used to share code and data with the international community. Especially in Data Analytics, researchers are encouraged to validate one another’s research results and this requires access to the code and data used. We also use GitHub to manage our web site. I noticed that patents form part of your work. Who owns these patents and who can use them? We plan to place a greater focus on patents in the near future. I have worked closely with researchers at the Korean Institute of Science and Technology Information and we filed a patent in Korea. Because of the nature of the patent (on pricing for QoS services), it is a concept that will be used in Korea but not in Trinidad and hence it did not make sense pursuing a local patent. Because we work closely with companies, we are very careful about Intellectual Property (and confidentiality) issues. For example, if a student is pursuing a degree at UWI then their thesis research is separate from any company related research. So any company related Intellectual Property will be partially owned by the company (as outlined in our MOUs) and thesis related Intellectual Property will be partially owned by the UWI. Can you explain, "a home for orphaned researchers”? As you know, over a hundred scholarships are provided annually to local students. Many of these students do truly interesting research (here and abroad) while completing their degree. However, when they return to Trinidad they typically do not have the opportunity to continue their line of research especially if they serve their time in a Ministry. So in some ways these students have lost their research supervision (and so orphaned) and we try to replace their prior research environment (i.e. home) as best as we can. "Optimization of taxis and maxis income" piqued my interest and is a good example of how TTLAB can benefit Trinidad. Where is this research and what next for it? This idea came about when UBER arrived in Trinidad. We wanted to see how technology can be used to help our local taxi drivers but without changing their present mode of operation. Let us assume that passengers are provided with an App they use when ready for a taxi. The App only provides their present location, their intended destination and the person is removed once they enter a car (and nothing else). Suppose that a taxi has multiple possible route options. Based on all passenger location information (as well as historical data about arrivals/departures) one can compute which of the routes is most profitable. Once the route is chosen the taxi operates as it presently does (i.e., there is no link between a taxi and an individual). This can be formulated as a Stochastic Dynamic Programming problem and is quite interesting. Note that the theoretical formulation and solution is being pursued for a thesis with the objective of demonstrating benefits to both taxi and passenger. Whether or not we take things beyond that point (to an actual application) is yet to be decided. How is TTLAB connected to ieee.tt? IEEE sections typically organise or support research related activities. Every six months TTLAB has a research preview where we present all papers published over the prior six months. The local IEEE section helps support this initiative. What are 5 things needed by TTLAB to do better work? Collaborations with more companies and the GORTT to have greater local impact. Funding to allow members to attend more conferences (e.g. last year a paper accepted at a flagship IEEE Smart Grid conference had to be withdrawn because we could not attend and present. More collaborations with the diaspora. Definitely yes. We spend so much money, time and effort on Innovation Conferences, Innovation Centres, Innovation Competitions, you name it. At the same time we continue to experience a brain drain because we fail to provide our bright individuals with interesting work, a flexible work environment and appropriate financial rewards. If 10% of the money spent on present activities was instead spent on such individuals we will at least start working towards a culture of innovation. Ideas come from people not from fancy buildings. TTLAB has no physical assets. Most of our communications are virtual and we typically use cloud resources and open source software. Our primary asset are the members. So back to your question, yes it is overplayed and until we truly understand what it takes to create an innovative society (not just a few innovative individuals) then this will continue to be the case. I want to thank you for the opportunity to share what we are doing at TTLAB. Our research is peer reviewed and presented at International conferences and Journals. Our work is also impactful in that we are assisting local industries mainly in the areas of Data Analytics and Operations Research. Members are therefore exposed to real life problems while at the same time doing more theoretical work for their thesis (if a degree is being pursued). Each member typically works on two more more projects and with 20 members one can understand that I cannot begin to cover all of the interesting work we do so please have a look at http://lab.tt or contact us at info@lab.tt.